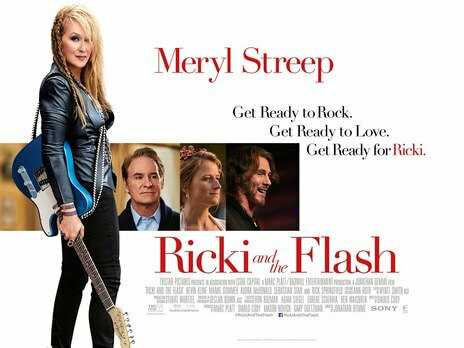 It makes total sense that Meryl Streep’s band in Ricki and the Flash is pretty much a cover band, playing old hits done much better by other artists in the past, with their obvious passion masking the overwhelming feeling of safe and inoffensive unoriginality. If you haven’t figured out our opinion yet, then you clearly need to take the Drax the Destroyer Class of Metaphors (incidentally, he’s not only a teacher, he’s also a student). Streep, in a role directed and written respectively by Oscar-winners Jonathan Demme and Diablo Cody, is Ricki Rendazzo who, with her band The Flash, perform regular gigs at a bar in San Fernando, California, their obvious dream of rock and roll stardom having clearly evaporated by now. Broke and working a second part-time job as a cashier, Ricki receives a call from her former husband Pete (Kevin Kline) who asks her to come home and support her daughter Julie (Mamie Gummer, Streep’s real-life daughter) who is going through a painful divorce. Naturally, when she does come back to the family she left behind, not everyone in her family is pleased to see her, and you can probably guess where it all goes from there. A predictable plot removes the tension from several conflicts, especially in a family drama like this, and when it does reach the various points you know they’re going to hit it’s still rather underwhelming. Films that have come and gone with similar set-ups have dealt with the material in more intimate ways, and Ricki and the Flash comes off more as a cold imitation rather than its own thing. The rare spark of original inspiration is here and there, represented partly in an original song that Streep performs acoustically called “Cold One” only the one time, but other than that this is the kind of film where you go in knowing exactly what you’re going to get. It’s a shame, because both Demme and Cody have presented provocative visions in the past (Demme with films like Silence of the Lambs and Rachel Getting Married, Cody with her scripts for Juno and Young Adult), yet go a completely traditional route here, which we feel is unrepresentative of their talents. The problem also lies in the fact that everything is played extremely safe; for a film about a rock and roll singer, there are hardly any drugs or even any hints of a destructive party lifestyle for our main character (which though can be a slight relief to anyone wanting to avoid clichés, makes her more of a dry fish as a character), and the revelations and conflicts that arise within her family are nothing drastic, just a bunch of white people problems – it doesn’t help that they clearly live better off than most other families, so is there a reason to care about these particular rich white folks? The plot’s predictability and the inoffensive material clash with each other to make a film that only Streep fans will want to have amongst their collection of all her other films, and even then it’s not essential viewing. Whilst we’re on the subject, Streep is refreshingly NOT trying to win an Oscar here (we can see a possible Golden Globe nomination, but that’s about as far as we can go) but she’s still the glue keeping everything together with a good, lively performance that fanatics will undoubtedly eat up. Streep impressively sings all her songs live (anyone who still suffers Vietnam flashbacks from Mamma Mia will probably want to give this a miss), and it’s clear that her vocal skills from Into The Woods have transcended well enough over here, where the songs are more conventional and jukebox fodder. The supporting cast does their best to keep up with her, most notably Gummer who gets a number of strong sardonic moments, but they can’t help but feel restrained by one-note characters who probably need another scene or two to have that dramatic outburst that they’re so desperate to convey. As a take-it-or-leave-it flick, Ricki and the Flash will certainly not rank among the many other classic films that Streep has attached herself to in a leading role, but instead will probably best be preserved as a harmless and inoffensive film for fans to kick back to and enjoy without worrying too much about things. Just play what the people want to hear, and nobody will bother to call you out on it. Ricki and the Flash is inoffensive material that is kept from graces by a predictable plot and an overall safe attitude, but Meryl Streep is what holds things together with a lively performance that fans will certainly enjoy but not too much to add to their essential collection of Streep classics.